I: So first, could you tell me about your research? I: How about starting from the reason you started your research? Kimura: I entered Kyoto University’s Faculty of Science in 1978 to study maths. But, around about the time when I became a sophomore, I started to think whether or not I should be doing such things. I remember it was around the early 1970s when the Club of Rome published a book called The Limits to Growth which was the start of discussing the so-called global environmental issues. The argument at the time was that it was dangerous to continue living in the ways we did then and the discussion included references to population problems and pollution problems. And, I got interested in those. In order to solve the population problem, it is obvious that we need to reduce the number of children we are having, but what happens if we reduce the number of children? What would be a good way to live? Or to put it in a rather dull phrase “what is happiness for human beings?” These were some questions that I was starting to feel I needed to ultimately think about. 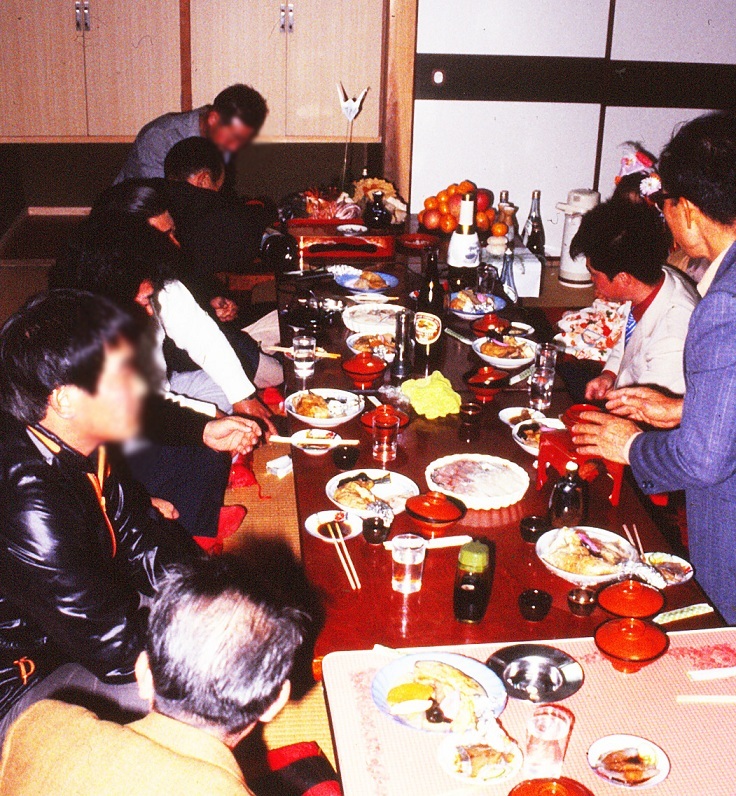 Back then, I was also invited by a friend to an anthropological research group named Konoe Rondo (current The Anthropological Society of Kyoto), so I attended it and as I was helping them with their research I got interested in the discipline. I honestly did not know what to do to overcome my woolly-mind but I felt that if I did what is known as anthropology, I would be able to do all kinds of things. The wideness of the discipline and its methodology of conducting fieldwork were really new to me at the time. So I decided to study anthropology. I knew that there was an anthropology seminar also in the Faculty of Science and Professor Itani Junichiro taught there. It was a center for studying apes. At the same time, they were conducting research on hunter-gatherers. Professor Itani was also studying a pastoral group called the Turkana. So I started to think about applying for the Graduate School of Science. It was in my final year as an undergraduate that I was thinking of whether or not to apply and then visited Professor Itani’s office to listen to what his research group was doing. At the time, the professor had just started his research on the Turkana, so I first read his book “Turkana no shizenshi (The natural history of the Turkana)”and then his famous book, “Takasakiyama no saru (The monkeys in the Mt. Takasaki).” While reading his books I discovered that he wrote in such a beautiful way that I was sincerely moved. I thought that if someone could write in such a grand manner, then this person must also be a great researcher and I was determined to study with him. At the time, Professor Itani was writing a column called “Watashi-no-rirekisho (My personal history)” in the Nikkei Newspaper and there it said that he was taken by Professor Imanishi Kinji to an island called Kojima in Miyazaki prefecture which has been described as the place where research on monkeys started in Japan. He wrote that when he saw the monkeys there, he was determined to study them and escaped his adolescent angst. I was moved also by this story that I decided to apply for the school. But the entrance exam was coming in September and when I decided to take the exam it was already June… So during the intervening three months I intensively studied biology and anthropology. I passed the first exam, but failed the second. Yet, I decided to take the test again in the coming year. After that, I went to the Okinoshima Island with Mr. Ota Itaru (who is now a professor in ASAFAS) for research on cattle grazed in the mountainous area. I: So did you go there during the year you were preparing for the exam? Kimura: It was after I knew I had to spend another year to study for the exam. Mr. Ota managed to get some money, and he asked if anyone wanted to join him, so that was my first trip for fieldwork. I had not even traveled by myself and suddenly went to the field to study, so I experienced a great deal of culture shock there. Before then, I was in a tea ceremony club. But people who conduct fieldwork sometimes intentionally behave savagely, don’t they (laughter)? So when we went there we rented a house for five to six people for boarding and we cooked and ate together. When I was told to cook miso soup, I asked what I should put in it, and people laughed at me. We took our rice balls we made for lunch when we went into the mountains to study what the cattle we had labeled with individual identifications were doing and to check where they were. We stayed in the island about two weeks for the fieldwork. And in the following year I studied hard and managed to get into the research group for human evolution studies. I had been conducting my work for my masters in Japan, but for my doctorate studies I was told to go to Africa if I was to conduct fieldwork: I was designated to go to Zaire. I: What kinds of studies did you carry out first? Kimura: While I was in Japan I was conducting research in a place called the Tokara Islands, but the first year of my research was distressing. After I came back to the seminar and gave presentations, no one was interested in my research and some even yawned during my presentation. So I felt that it may be end of my research (laughter). What I did then in the second year was to collect data on the islanders’ inter-personal relationships. Before then, I was trying to do various things including collecting data on the gathering of plants and the cognitions of fish, but neither of these were successful. So in the end, after I managed to collect data about who was drinking with whom, I wrote a masters dissertation on this(Photo 1). I also had a desire to write about people’s inter-personal relationships based on the fieldwork I was going to do in Africa. Then I heard that the people who decided where I should go for my fieldwork had discussed that it may be better if they sent me to a place with entangled human relationships, and thus they decided to send me to people from an agricultural society. So I was sent to Wamba in Zaire. In Wamba, there was already a group of researchers studying the Bonobo and there were two senior ecological anthropologists who had been studying there before me. While I was the third anthropologist to join there and although I had studied ecological anthropology, I still wanted to conduct research on the social relations of the people. When I actually went there, it was quite tough at first. I could speak almost no Lingala, which is the local language. Because I could not speak their language, I could not understand what they were talking about; and because I couldn’t understand what they were talking about, I could not participate in their conversation. So it was like a vicious circle. However, after spending about a month in a place where there was no Japanese around, I gradually began to speak their language(Photo 2). After that, I got a scholarship from Kodansha called the Noma Scholarship, which meant I could spend two years there. The first year, although I tried several things, they didn’t turn out well. In the second year, my engine may have started working, and I managed to collect data. In the end, what I found to be most interesting was the world of voice. For example, curiously enough, there was an old man shouting in the middle of the village without any listener. I was finding it curious from the first day I saw him do that and I felt that I would like to understand this phenomena. However, I did not know how to find out the answer and so I tried out several things. In the end, I decided the methodology and spent the last two months on intensively collecting the data. Since the Bonobo researchers had a video camera with them, I borrowed their camera and recorded the scene when the man was screaming. Back then, portable video cameras were quite new. I brought the data back and wrote my doctoral dissertation on that. I: Is Wamba a place which you went by chartering an airplane? Kimura: Yes, that’s right. And after I returned to Japan in 1989, the internal conflict broke out in Zaire and it became thus too dangerous to enter. I first went to Zaire in 1986 and came back in 1989 and I was thinking to return there again to continue my research as soon as I finished writing my doctoral dissertation. Moreover, I was beginning to understand their language quite well, and I still had things I wanted to do there. But, I could not return there again. 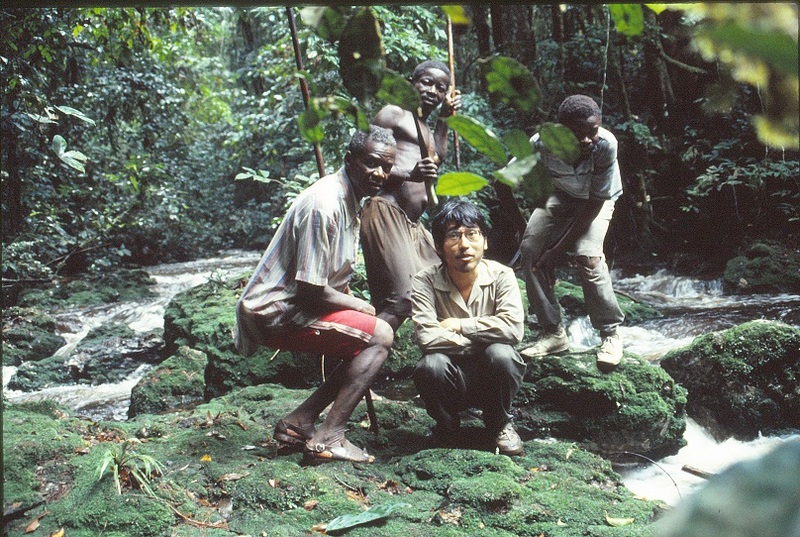 At the time there were many researchers from Japan conducting different kinds of research in Zaire, but since all those people were no longer able to get back to Zaire, they flooded into other countries as if they were “displaced people.” We moved to the west and at first there were suggestions that we should go to the Republic of Congo, but the Congo also became dangerous, so we skipped it and went to Cameroon, which was the country next to it. As a result, I went to Cameroon in 1993 to begin conducting extensive research. The research in Cameroon has continued up until now. Recently, in these past five to six years, we have also been able to go to the DR-Congo (former Zaire) again, so now I am also conducting two research projects at the same time. I: I did not know that a person like Professor Kimura also had a period when you didn’t know what to do. Kimura: I suffered in that period. Although I entered the village, I did not know what to do. So I had days when I spent the whole day in my room reading the Japanese books I had brought from home. Feeling terrible about myself, I questioned “Is this what I should be doing travelling all the way to Africa (laughter)?” These things happened often in the beginning in the field. I continued to think and struggled through various trials and errors and I wrote down the ideas that came into my mind onto the field notes. Some of these ideas bore fruit after a long time, but altogether only 10 to 20% of such ideas can become real. I think it is truly important to have many persistent ideas and to keep them in yourself. Our graduate school’s approach in teaching is to tell the students to go and conduct fieldwork. There are pros and cons about this style of teaching, but I myself was educated in this way. I was thrown out to the field. People didn’t give me much advice when I departed, but always criticized me a lot when I came back (laughter). Well, I agree to some extent that there has been no other way. Yet while it may be inefficient, I think it is necessary to at least experience the self-hatred of “what am I doing here?” once and overcome it. This is like a rite of passage to become a fieldworker. Rites of passage are supposed to be tough, right? Otherwise, we cannot proceed to the next stage. Kimura: When I go to the field, I feel the compulsion to write down all the things I think about onto the field notes. Whenever I visit Africa, I start writing from the moment I get on the bus to the Kansai International Airport and finish writing on the bus back home from the Kansai airport. I continuously write my field notes all the time. When going to sleep, I always keep the notebook next to my pillow. I: Recently, what have you been studying in Cameroon? I: Could you tell us about the characteristics of the African studies? Kimura: Hmm, everyone says their main emphasis is on fieldwork. Basically, the former institute of the African Studies, which was the Africa Center, strongly held the tradition of ecological anthropology of the Faculty of Science. Within this tradition, the distinctive feature is to collect “concrete data” thoroughly. I think the discussion in the seminars is formed on this basis, and if we didn’t present precisely enough in the seminars we will be asked questions such as “do you have the data?” or “did you really see it?” I think we can be proud of this strictness concerning the data from the field; and I think this is one key characteristic of our school. At the most basic level, we try to get data which most accurately reflect reality, no matter whether the data is quantitative or not. In the presentations at the seminars, not everyone presents quantitative research. But whatever form the data is in; there is always a critique of whether or not the data is true. It is difficult to tell what is “true,” but if someone records that “Person A spoke about X,” then it is important to correctly understand the meaning of the speech within that context it was spoken; whether it was a desire, a complaint or maybe some service for the researcher? The common trap that the novices often fall in is to write down what they see and hear as it is. At first, that is unavoidable and understandable, but we teach the students to amend this mistake. I: Please give some advice to the prospective graduate students who are wishing to study at the African Studies, for example, what sorts of student you are wishing to take in; or please tell us anything it would be valuable for them to experience during their time as undergraduates. Kimura: I myself, had never done any travelling before I started my fieldwork and jumped in with a group of people who had always been involved in activities such as alpine club activities. In the beginning, I went through an experience of culture shock. And at the end, a person like me could do it, so people who have never been to Africa can study it too, if you have the interest and the passion. I: What sort of people would suit this study? It is difficult to tell what is interesting. But I think if you truly enjoy it yourself then other people are likely to also be interested in your research. It doesn’t have to be useful research in the moment. I think research is like that. I: Could you tell us about what is attractive about your field site? Kimura: Wamba in DR-Congo is about a thousand kilometers away from the capital city Kinshasa in airline distance. The Congo has been enduring wars since the mid 1990s and it is only recently that areas outside of the east have settled down in peace. Because of this situation, the transportation system has not recovered. Some years ago, we could take a plane to one point and then drive a car for four hundred kilometers to get to the field, but now this is impossible, so we charter an expensive Cessna aircraft from Kinshasa to Wamba. But last year (2011), we decided to charter a boat from a town called Mbandaka. If you look closely you can see that it is shaped like a catamaran which is made by connecting two boats (Photo 4). They attached two engines and carried around twenty barrels of gasoline at the back. Using this plan, we could get to the place more cheaply. We could also carry a lot of luggage. If we fly on the airplane, there is a luggage limitation. So we decided to travel from Mbandaka to Wamba by this means even if it took longer. I: I did not know you also did such a thing! It is an impressive ship. Kimura: It was difficult to find the ship in Mbandaka in the first place. We had asked some people to start to organize it before we had arrived there, but our departure was still delayed a lot, and when we were about to depart another thing happened. Wamba is located in the upper stream and Mbandaka is at the lower stream. 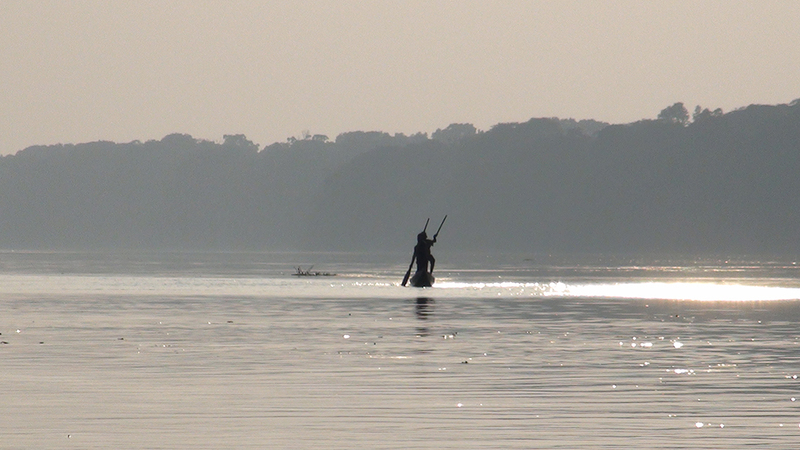 Since people could come down the stream on a rowing boat to Manadaka, there are many people from Wamba in Mbandaka. It is also because Mbandaka is the provincial capital and the city. But to get back to Wamba, people need to travel on boats with engines. It is impossible to get back up stream on a rowing boat. So many people wanted to get on our boat that we had found. Like the story Kumonoito (Spider’s Thread) by Akutagawa Ryunosuke, people emerged and begged to go on the boat. But if we take too many people on it, the boat will be too heavy and the gasoline is going to run out in the middle of our travel; so we told them that we unfortunately could not take any of them. Then when we were about to finally depart from the port, the people who wanted to get on the boat came on the boat and sat there. We didn’t literally kick them out of the boat, but we did take them off. Finally the boat departed and so we were pleased with our efforts, feeling the cool breeze and were relaxing. But then, when I went to talk to the boatman who sat at the end of the boat, about some matter, climbing over the mountain of luggage I realized that somehow there were several of those men whom we thought we had managed to take off the boat. I found two of them and thought: “There are two blockade runners. We couldn’t stop them from coming on the boat. We can put them off the boat at the next port we are stopping at.” But actually, there were seven or eight of them, and their luggage, although smaller than ours, was also loaded on the boat. We thought about what to do with these blockade runners. If we tried to get them off the boat, there was going to be another big quarrel and so we gave up and took all of them with us. But because of this the boat was a lot heavier; hence the boat arrived with about two days of delay. In total there were about twenty people on the boat (Photo 5). I: That is a lot of people. This boat is made of wood, isn’t it? Kimura: Yes, it is a piragua. We were sleeping on the beds in this area where there is a roof (Photo 6), but I wonder how the blockade runners were dealing with the rain while sleeping, since they were in the front and the back of the boat. As a result of the troubles we had, we took twelve days while initially we were planning to get there in a week. I: So it took almost twice as long. Kimura: Yes. The boat had been running all day and all night, while we were almost all the time lying on the bed. And when we got back on the land surface, our legs were wobbly like those of the astronauts, so this was tough. Yet, the trip was interesting as I could see beautiful scenery like this (Photo 7). This one is interesting. It is a gigantic floater (Photo 8). It is very long. It is about 100-meters long. As for what is on the floater, if you look closer, they are houses. They build these houses on the top of the floater, so it is like a city on a floater. It is like that a whole city is floating. I: What happens after this floater reaches the lower end of the river and wants to get back to the upper stream again? Kimura: I think they travel down until Mbandaka, but near the place where I saw the floater, people are cutting down trees (Photo 9). So they build a floater like this to carry down the timber. They flow down the river and reach their destination at some point. I: That means these timbers which are functioning as a floater are also commercial products? Kimura: Exactly. The timbers are the important thing and those people on the top are just to accompany the timbers (laughter). It has been a while since logging has been conducted in Congo, but I guess the timbers cannot be carried on the trucks since the land transportation is not functioning. So they send the wood down on the river. There are many logging roads being built and thus if we look at this map, which was compounded from Landsat satellite imagery, we can see many of these roads. I: Who built these roads? Kimura: The logging company is building them. In the tropical forests, tree roots do not go in deep, so it is easy to remove them if you use a bulldozer. That is why it is so easy to build the new roads. There is a company called “Congo future” and this company is conducting this action. Kimura: It is an ironic name. I question whether or not there is going to be a future by cutting down so many trees. 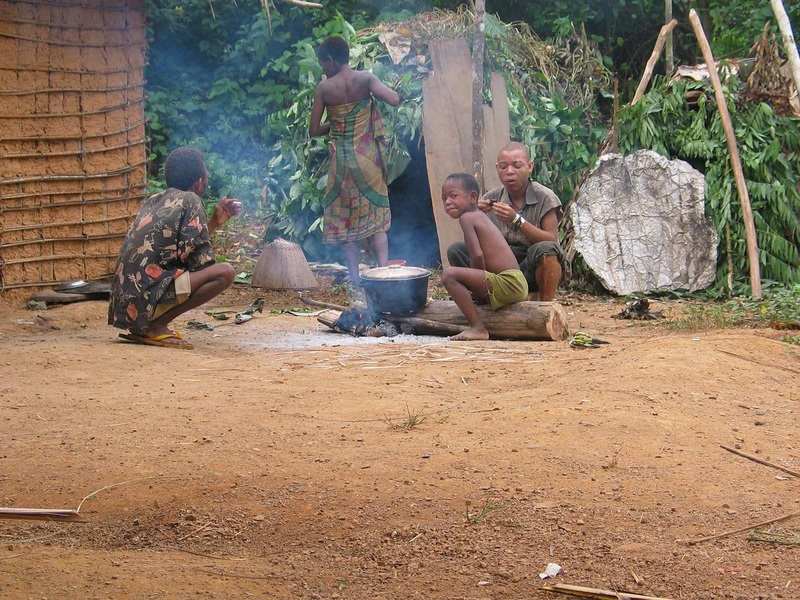 There are many logging roads in the southeast of Cameroon as well, and the forests are being cut down there too. So anyways, together with these stories and troubles, the trip was quite a challenge, but it was also interesting. I: Yes, after hearing I now feel that I want to do it as well, having heard your story. Kimura: It is exciting, but there are also lots of difficulties (laughter). I: Please share some interesting stories with us for the students who are reading this. 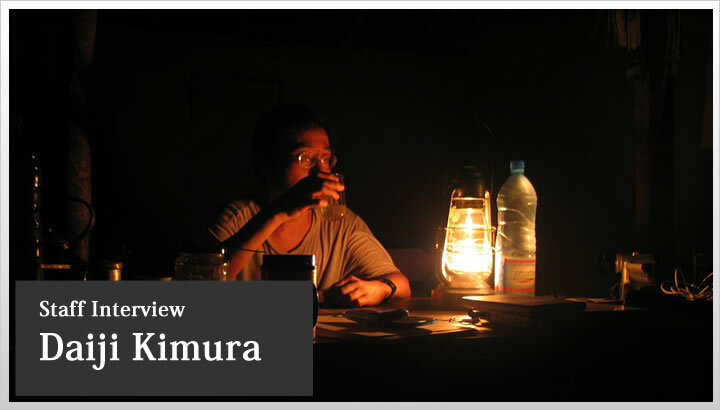 Kimura: I certainly get a heroic feeling like “I am exploring! Probably, no one has done this before.” In fact, there are places in Africa in which I was the first Japanese to visit the place. I: I do feel like having a go, but I wonder whether I can manage under such a rough situation. Kimura: You will find it manageable once you have started it. Taking a trip on a boat was a new experience but I enjoyed it. Next time, I am thinking of travelling on a motor bike to Kisangani, around next year. I: What things do you find have changed since you visited the field sites for the first time? Kimura: First, about the field sites in Cameroon, many development projects and new registration for national parks are taking place and as a result the whole place is becoming busier. The numbers of cars and bikes have increased. New roads are being built in places where there has never been one before. The village I am conducting my fieldwork is situated in a remote place, far from the capital city, and although I haven’t had the opportunity to visit there in the past four or five years, the people who are conducting research there now are telling me that the field is getting increasingly noisier. Previously, the cottage we built for conducting research was situated in a tranquil village where no cars came, but I heard that the place is now very noisy. A bar was built nearby and music is kept on for the whole night in an extremely high volume. These are the changes that occurred in our Cameroon field sites. Regarding the Congo on the other hand, you see pitifully little change. Since the economic situation went bad, as a result of the war, the country has sort of receded. For example, people previously used kerosene for lamps, but now kerosene is not available for them. When we re-started our research in 2005, we were all surprised at this situation. Thus when I had taken some kerosene with me, people gathered around me asking me to give them some. So I shared it with some good friends of mine there and was surprised to discover that some children who were around five or six years old had never seen a light with kerosene before. So for a long time, there was not even kerosene available for them. Before, we could get it if we looked out for it. People could also gain cash by selling coffee before, but now since the roads have been destroyed, trucks have been unable to transport the goods and the people have been unable to sell their coffees. Therefore, they have been unable to gain cash. So what they do now is; they walk on foot to the city called Kisangani, which is 400 kilometers away from their village, to sell their products. It takes around a week to ten days to get to the city on foot. I asked them where they stay at night, and they answered “we sleep in the forest.” I asked them what they do when it starts raining, and they answered “we get wet.” They walk to the city to sell commodities such as dried meat, dried fish and alcohol and with the cash they receive, they buy things such as salt and soap to take back to the village. This is really wearying. Before they didn’t do this, but now they have no other choice. The changes that war brought are incredible. There wasn’t any direct attack on the village where I have been conducting my fieldwork, but indirectly the village has been affected in this way and the situation has been declining. I: It has only been five years since I first went to my field site, but I do feel that things have changed in those five years. For example, the main roads have been cleaned. So having heard your story about Congo, I realize there are also places where the situation has been devastated. Kimura: War is not good. Whatever happens next, I hope they can avoid another conflict. Although the change is gradual, the Congo is getting better too. When I visited there at the end of 2005, there weren’t many things sold in the market, but recently they are selling more things. People’s hearts had also become closed and harsh at one period, and when I resumed my research there, the people of the village had held a meeting in which I was taken to a kangaroo court. They urged me to give them money and told me that otherwise they would not let me resume my research. So I consulted my informant and thought that if we gave money, and if the money benefits all the people in the village, we wouldn’t mind giving some to them. So, I decided to finance with my own money the reconstruction of a bridge which had been demolished preventing any cars from passing through. My informant led everyone in the village and cut down the trees, bought nails and rebuilt the bridge. Two bridges were rebuilt with a total of a thousand dollars. I: Wow! That is amazing. Kimura: So before, there was quite a tough requirement to acquire their permission to conduct fieldwork in that place, but now such a harsh requirement is less likely to be raised and people’s feelings have also gradually eased off. Kimura: Yes, kind of. Indeed, in Congo, it is like that the bottom has fallen out and we just need to laugh away. It is interesting indeed. It is like becoming accustomed to nuisance. For example, I began to enjoy riding on poorly paved roads. The roads in Cameroon are far better than those in Congo. I once said “something is missing in this driving.” Then I was asked “do you prefer roads that are not well paved?” I actually do have this kind of preference (laughter). Currently, the locals are founding NGOs and trying out several things to revitalize the village which is one of my research topics. About ten of these kinds of projects or movements exist in each village. But there are a few problems. For example, they can be short of budget or sometimes when they are not cooperating well amongst each other the NGOs can become hostile to each other. This can also be due to the background that society is rigidly structured in a paternal logic and thus enmity between two villages can be fierce. We need to recognize these social structures; otherwise we won’t be able to understand the phenomenon correctly. I do want to help them overcome certain situations, but sometimes the roots of a problem are deep and cannot be easily fixed. I: While continuing your research, have you also started thinking about practical matters as well? Kimura: Yes, it is natural. At first, I didn’t have any intention to help them with their problems, but I came to feel differently. Even if I did something in such a big country like the Congo, the size of the difference I could make would only be as small as a drop in sea, but I would like to do something good for at least the people I am engaging with. Hence, I am studying about protein for my research funded by the Grants-in-Aid of Scientific Research. The numbers of the wild animals in the forests near the village are decreasing and the people are starting to kill animals such as Bonobo. This is a problem happening in every tropical forest of Africa. Thus, with the Grants-in-Aid of Scientific Research I am studying whether they can increase the amount of domesticated animals or fish resources instead. There is not much we can do, but our colleague, Naoki Matsuura (University of Shizuoka) is supporting a local NGO and he is attempting to breed pigs in order to increase their numbers. I: I am always agonizing about what I can do for the local people, since they are also always helping me and I owe a lot to them. Kimura: It may sound like self-applause but, it is us who know about the locals’ situations. So through writing about their situations and informing the wider public, I would like to help them. The public find it difficult to believe through mere statistical data and hearsay statements. So our experience of seeing the actual places is an advantage. And we are collecting the data in a step-by-step fashion. These are our specialties. I: Thank you very much indeed for today’s interview!